My daughter loves bling. So, when she discovered that she could add shiny rhinestones to her plain shirts and bags, she was very eager to give it a try. We used a hot-fix rhinestone applicator and 4 mm diameter rhinestones for this project. Please note, however, that this device gets really hot and can very easily cause burns. Thus, please proceed with caution (especially when working with children). This project also requires a bit of patience, because attaching each rhinestone takes around 10 seconds (when you multiply that by the number of rhinestones in your pattern, it can quickly add up!). My daughter first drew a design by hand. We then recreated her idea with more precision in Inkscape (a great free and open source vector graphics editor). You can also start with a ready-made template, those at free letter templates are made especially for rhinestone patterns. I also prepared a Muumade_Free_PEACE_Symbol_Rhinestone_Pattern which you can download. 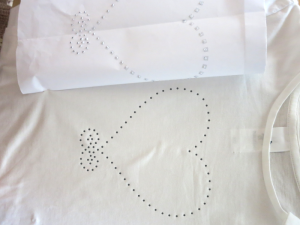 The design shown in the photo above, as well as the free peace symbol template, is approximately 15 cm (6″) high and 15 cm (6″) wide, and the dots for the placement of rhinestones are approximately 5 mm (3/8″) apart from each other. 1. Place the print-out of your design on top of a mat or a sheet of thick cardboard. 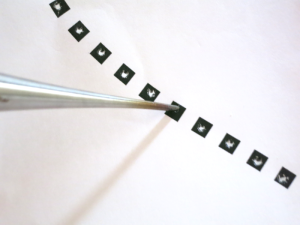 Using a pointy tool, such as a straight tailor’s awl, make a hole in every mark in the pattern. 2. Put the pattern on top of the shirt. We placed it so that its top edge was approximately 10 cm (4″) below the collar of the shirt. Pin or tape the pattern so that it will not move around. 4. 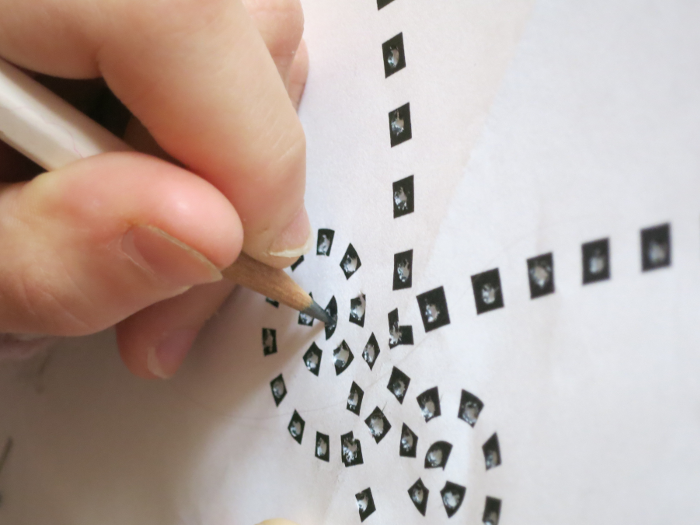 When done, remove the paper pattern. 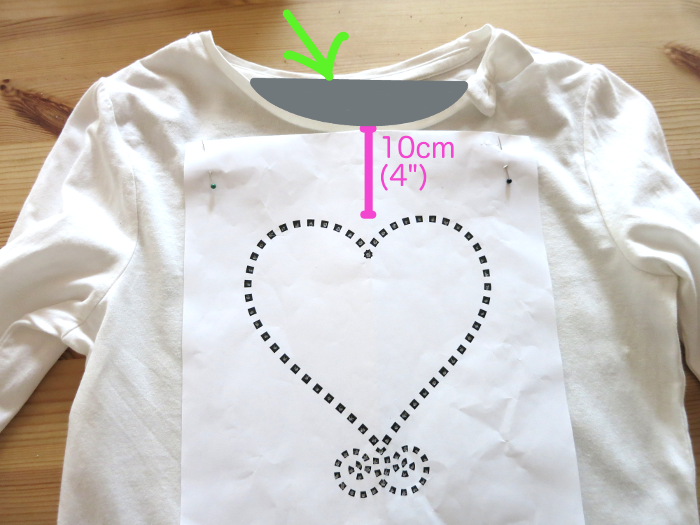 You should have a nicely traced pattern on the shirt! 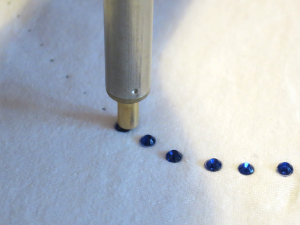 Now you are ready to start gluing the rhinestones onto your shirt. As for how to use a hot-fix applicator, it is best to follow the instructions which came with your device. I just want to note that we first tried using a precision tip (with a concave end), but it left a faint ring mark around the stones. In the end, we found that a hot spot tip (with a flat end) gave a much cleaner finish. 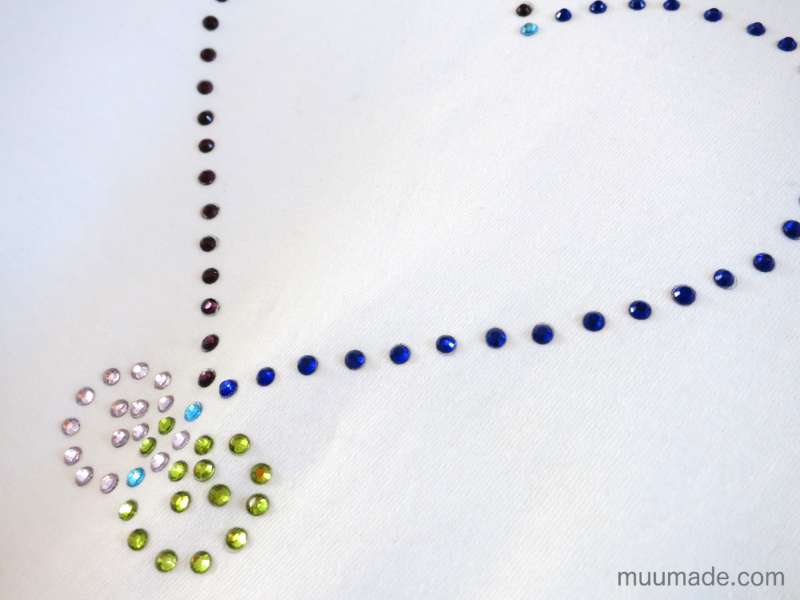 If you would like to share an image of your rhinestone pattern, please visit Muumade’s Gallery.